Heavy Barrel was one of my favorite games at the 80s arcade. If you had kept a total number of plays on every arcade machine throughout my life, this would probably be #1 on my list. For those that need a refresher's course, Heavy Barrel was a one or two player shoot-em-up or run-and-gun type game released in 1987. Each player had a main gun and grenades to fight off the enemy during the game. By collecting keys and unlocking boxes, you could obtain different types of guns, grenades and shields. You could also find parts to assemble the "Heavy Barrel" gun, which had a range of about half the screen. Once assembled, you had 30 seconds of unlimited fire power to destroy as much as possible with this ultimate weapon. Heavy Barrel was a great arcade game for so many reasons. For starters, it had a unique joystick for controlling your soldier's movement and your weapon aim at the same time. You could proceed forward through each level and at the same time, direct your weapon and grenades 360 degrees to fire at the enemy. 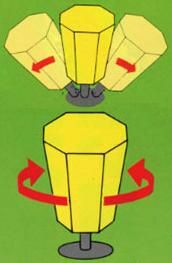 According to Priglmeier.Com, Heavy Barrel is one of only about 20 games to use this style of rotary joystick. Another great feature about Heavy Barrel was it added other elements to previous run-and-gun games like Rush'n Attack. 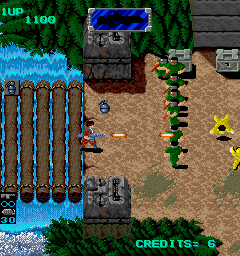 There were similar games that were more popular at the time like Contra, which had the sole purpose of shooting all the bad guys and advancing to the next level. But Heavy Barrel gave you short terms goals like collecting those precious keys to unlock better weapons, grenades, and Heavy Barrel pieces. That made the gameplay much more fun and a step above Contra in my mind. In 1990, an NES version of the game was released. Of course it was one in my collection at some point. It did a pretty good job with copying the concept, but just didn't have the control and gaming experience you received at the arcade. In the early-mid '90s, a good friend and I had a favorite hangout that was basically a hamburger stand with an attached game room. They had some classic arcade games like Pole Position in this hole-in-the-wall joint, but lucky for me, Heavy Barrel was also included. I usually gravitated to that game and remember my experience got to the point where the challenge was trying to beat the game on one quarter. Even at that point, I never grew tired of the game. There are just some games you can play forever and get the same great experience each time. This was definitely one for me. Thanks to Arcade-Museum.Com and Wikipedia.